Meet in the Georgetown district of Washington DC at your selected time to board your sightseeing cruise of DC. Cruising south along the Potomac River, enjoy amazing views of the skyline with a glimpse of Vietnam Veterans Memorial, Korean War Veterans Memorial, Franklin Delano Roosevelt Memorial, Thomas Jefferson Memorial, Martin Luther King, Jr Memorial, National Mall, John F Kennedy Center for the Performing Arts and more, all gorgeously illuminated against the moonlit sky. 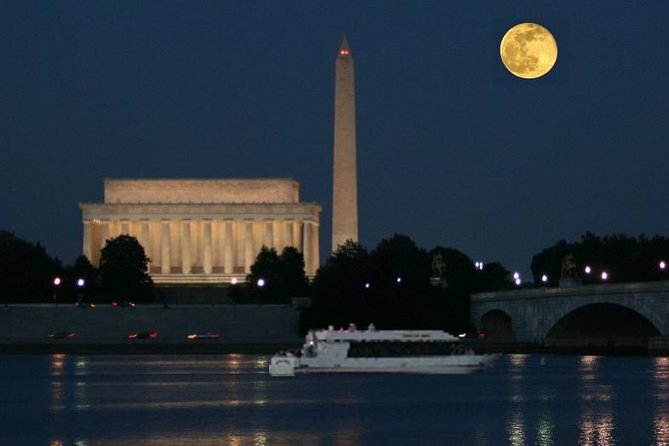 If you think these DC attractions are beautiful during the day, just wait until you see them at night! The reflections off the water are an unforgettable sight.Lounge in the climate-controlled indoor cabin or admire the DC skyline from the outdoor viewing deck. Your modern cruise boat has panoramic windows for optimal viewing, with soothing moonlight music to enhance your sightseeing experience. There’s also a full bar on board, so you can enjoy drinks as you soak up the views (own expense).Please note: Children under the age of 10 years old will not be permitted. This cruise is not a narrated tour. Great! Your order has been confirmed! You can always come back to access your order information in Your Profile, and feel free to contact us with any issues regarding your purchase.